The Changing Face of Virginia: I love Virginia history! This installment of The Changing Face of Virginia series is written by high school student and Blanton Scholar, Caroline Morse. 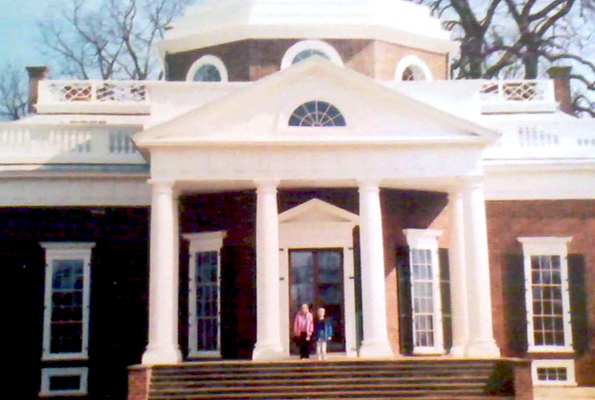 Caroline tells the story of how she first fell in love with Virginia history. Do you remember a similar moment? The Virginia Historical Society will hold the High School Historians Forum (formerly the Wyndham B. Blanton Scholars Forum) from July 20–23, 2011! If you are interested in participating in the Forum, you can apply online. Applications must be received no later than June 10. All rising juniors and seniors from Virginia are encouraged to apply. 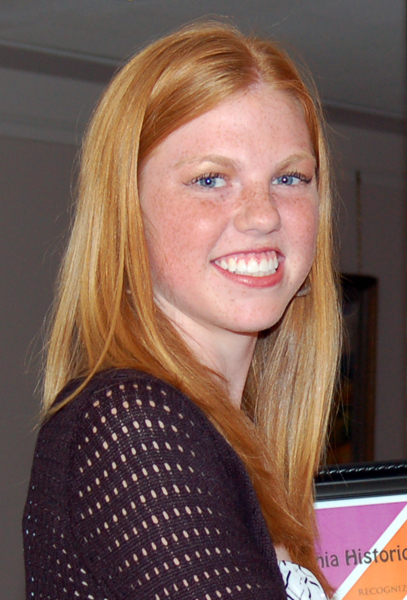 Caroline at the 2010 Blanton Scholars award ceremony. In my opinion, one of the most important places to live during one’s lifetime is Virginia. A part of the original thirteen states, Virginia is filled with rich history including the birthplace of our nation’s first successful settlement, Jamestown, and home to the capital of the confederacy during the Civil War. This state tells a story within itself. Growing up in Virginia, I was exposed to the beginning of U.S. history because Virginia is where it all started. I remember taking multiple field trips my 4th grade year to Williamsburg and Jamestown to learn about the life of colonists, and their role in shaping Virginia. I use to wonder why ladies dressed in big, heavy dresses with bonnets, while men wore long socks and a vest as I walked down the cobblestone streets in Williamsburg. I was fascinated with the deer-skin homes of the Indian tribes and the sound of the cannons shot every 30 minutes. And who could forget the famous Indian princess statue. “If you touch Pocahontas, you’ll always have good luck,” I remember my teacher telling me in Jamestown. My desire to learn the state’s history only increased when I had to create a scrapbook all about Virginia. 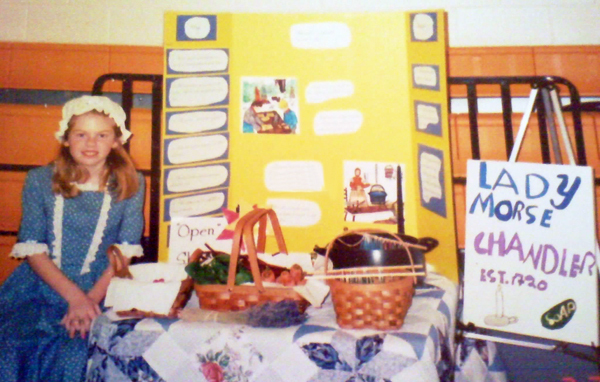 It included all of the state-born presidents, my visit to Monticello, and a personalized autograph from Congressman Randy Forbes, just to name a few.However, my favorite event during my 4th grade year was Colonial Craft Day. I dressed up as a chandler from Colonial Williamsburg, and was taught how to make candles and soaps by hand!Also, as part of the program, I learned to dance to “The Virginia Reel” with my fellow classmates. What an amazing experience! “I love Colonial Craft Day so much. I hope it never stops,” I wrote in my scrapbook the following day. Lady Morse at Colonial Craft Day! Jennifer Nesossis is the programs officer at the Virginia Historical Society. ← Learn about the Civil War in Virginia this summer…Be a VHS High School Historian! I recently acquired a very interesting spoon at an estate sale. After exhaustive internet searches on multiple search engines I have found the exact spoon only one time in Google images. I will include a link that will take you to the image of the spoon that I have but I realize a lot of people are wary of links from strangers so to view the exact spoon I have please go to Google Chrome (Images) and type in “Jamestown Colony triffid spoon”. I know that “triffid” may be spelled incorrectly, (I have seen it spelled trefid), but that was the spelling that I used that found the only image of the exact spoon that I now own. The image on Google was taken directly from an archaeological book that was published regarding an archaeological dig by John L Carter and J. Paul Hudson titled: ”New Discoveries at Jamestown. Site of the first successful English settlement in America.”. I have a metalware spoon that is stamped, on the back of the handle, in cursive, exactly like this: “Jamestown – 1607”. The dimensions of the spoon are approximately; 4” L x 1 and ⅛” W at widest part of round bowl that is approximately a quarter of an inch in depth. The handle is flat with a rat tail connecting from handle to round bowl and the handle ends with a design resembling a cross at the top of handle. The metal is undetermined at this time. It is obvious that it is old metal and somewhat pitted but in good condition for its apparent age. I am not well-versed in ancient or early antique spoons and I am very interested in finding out more about this incredibly interesting spoon somehow associated with an archaeological dig on the Jamestown Colony. I would appreciate any assistance that you may be able to provide me or any knowledge you may have or even if you could point me in the right direction as to where to begin to find out more about this wonderful little spoon. Again thank you so much for your time and effort on my behalf in advance and I do look forward to hearing from you with any news or bits pieces of information that may help lead me to the discovery of the origins of this most interesting spoon. Hello, Laurie. Thank you for reaching out to us about your spoon. You might want to reach out to Jamestown-Yorktown (toll free number: 888.593.4682) or Colonial Williamsburg (Brenda Leek,bleek@cwf.org). Their staff should be able to help you find some answers about your spoon. You may also want to reach out to an appraiser as well. Good luck!